2. Flinging Barnaby out of the darkened, quiet bedroom while trying to put the baby to sleep after he ran in, naked, grinning, laughing like a jackal (or hyena?) with a wailing Noah in the front room who had been rammed between an IKEA pillow, Barnaby’s body and the sharp edge of the couch. I had just explained how tonight, fighting was not going to happen – Daddy was out, having a drink (cue slightly angry face) and that Mummy was trying to do all the breastfeeding/bathing/burping/swaddling/dressing and putting to bed of four excited loud squeally children all at once, and so, therefore, everyone must be on their best behaviour. The flinging of Barnaby, which was fuelled by an upswelling immediate sweary rage, unfortunately resulted in his head thwacking the edge of the door. There was blood. And a tearful phonecall to said drinking husband to come home, NOW. It was entirely unstylish and regrettable. 3. I wasn’t watching the boys at breakfast, and newly tantrummy and devious Custard spilt his milky bowl of Cheerios all over the newish MacBook Pro. It now won’t really work. I blame myself, because that’s the kind of mood I am in. 4. I cannot stop hoovering up the foodie treats people have been bringing around. In fact, today I have eaten seven bits of citrus slice, two portuguese tarts, coffee and belly’o’pork. Hardly commendable (but v noice). 5. I have decided I cannot do the school run on Wednesday for at least another two weeks which means Mark has to do it. It seems to me that taking small babies out in the snow and rain by 8am alongside three disinclined small children is Too Hard. My milk supply might dry up, or something. This puts Mark in an awkward situation whereby we have to hire a short-term part-time nanny. No one is happy about this. 6. Custard has twisted the arms of my glasses so that they sit wonkily on my face. The effect is akin to being jetlagged, or a little bit wasted on cheap gin and cold and flu tablets. I am dizzy and irritable, and clearly need new Miu Miu frames. They slip off whenever I bend my head even slightly toward the floor. I cannot begin to explain how annoying it is. 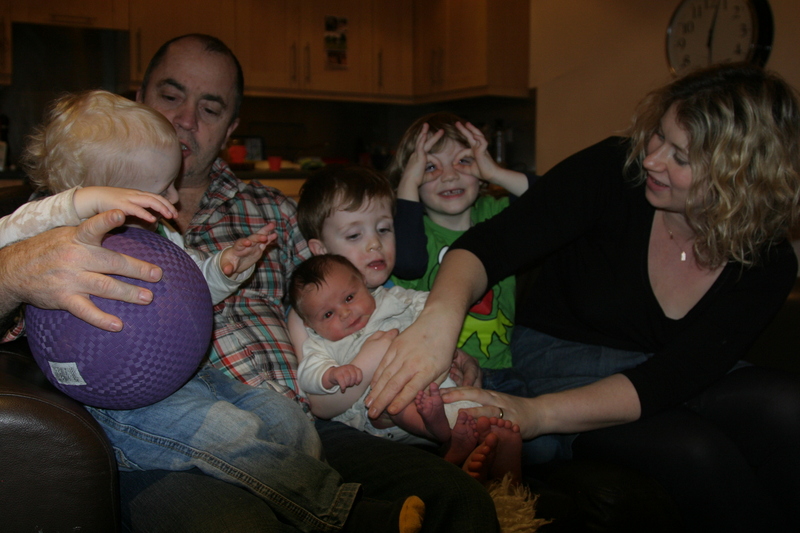 Here is a photo of us, as a new family of six. Witness the chaos. How do we do it, you wonder. Badly, Dear Readers, badly. Sheez, I have one baby, and it’s summer, and I STILL can’t get out of the house before 9am. So you are totally right that doing the school run with 4 small children in icy winter is Too Hard. WAAAAAAAY too hard!! P.S. In that photo, Ned looks a lot like Casper as a baby, no? sorry I’m giggling – you are doing so well… it brings back memories of my half-crazed antics with our kids that I wouldn’t even dare to blog about! Bravo. I don’t think you can do the school run EVER. Part time nanny should not be temp, should be Permanent. You are doing incredibly well, it is an impossible task you are doing. I often (always) do end-of-day madness alone and it is almost always difficult and shouty. A rare day when it is not. I too have pushed shouty boys out of darkened rooms while baby is supposed to be going to bed. I don’t think Jon knows what quiet feels like. Dear God – I’m with Cath. You must have some help. I had a 20 month old and an infant and trying to do a few huors a week consulting thought I might die (I was essentially a single parent then and officially one a year later). Sme childcare/nanny assistance is critical to you sanity and truly, it is much easier being a good Mum if you are not exhausted and overwwhelmed. Thinking of you, wish I could help a bit, even just by holding lovely new Ned!